Hi, everyone! Heather P. here to share my 'Winter Wonderland' project with you... To create my card, I started with a white card base, and stamped the large tree image from Winter Woodland in versamark ink before heat embossing with white powder. I then used three different ink colors to create my blended background (aqua, turquoise and navy) before using the Scenery: Big Bang Circle Creative Screenings and embossing paste to add a snowy background to the card base. I then cut a strip of silver foil card stock and adhered it to the bottom of the card front. 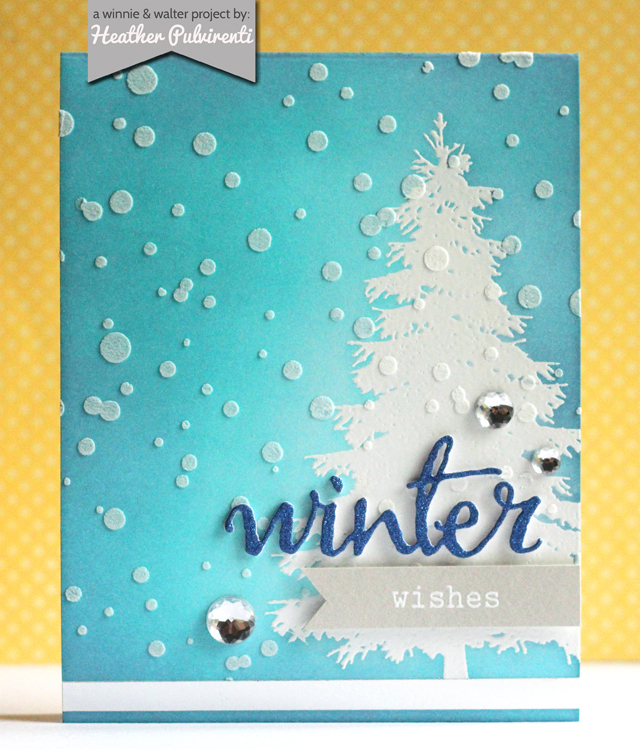 Next, I die cut a bunch of winter sentiments (4 white and 1 blue glitter) using the Big, the Bold and Seasons Cutaways. I glued the die cuts together, then adhered the sentiment to the card base. The remainder of the sentiment was stamped in versamark onto gray CS before heat embossing in white. I trimmed the edge of the cardstock strip to give it a banner shape, then adhered it to the card front with pop dots. To finish up, I embellished with clear gems. Well, that wraps it up for me today... Have a great one! Gorgeous card. Also love the pop of darker blue of the sentiment and the white-embossed 'wishes' against the soft grey cs. Gorgeous, Heather! Love the contrast with the rich blue glittered Winter. beautiful card!! love the color..
LOVE your heat embossed tree and embossing paste snow - WOW!!! Absolutely gorgeous...love the inky work. Heather is such a genius, this is so beautiful!! 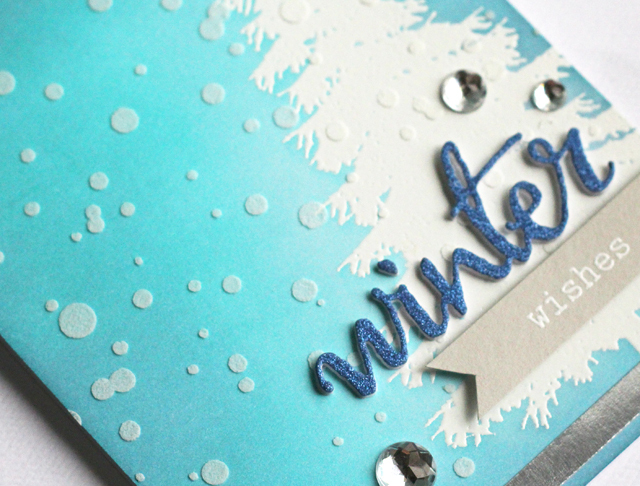 Love the blue and white and the embossed snow is gorgeous!